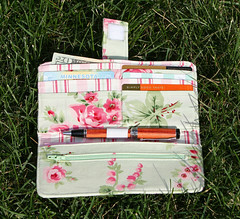 This is the first wallet I made and it is from the pattern "A Girl's Best Friend Wallet" by Jenna Lou Sewing Patterns. 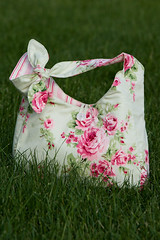 The fabric is Freespirit's Barefoot Roses. I cut the seam allowance out of the interfacing. I think it would have been difficult to sew otherwise since it requires pellon craft fuse. The inside of the zipper pocket is the backside of another piece of fabric. I think it would have been nice if it were the right side. The zipper pocket forms a pocket behind the whole thing as you can see in the below photo where the piece of pink paper is. I sewed a button on the velcro strap before topstitching around it... that caused great difficulty when the button was in the way of the presser foot during top stitching. I finally figured out a way around it and got it stitched. I had to seam rip a little bit larger opening to turn the whole wallet right side out after sewing the wallet outside and inside together. I cut the card pockets an extra 1/4" taller so i could fold down the seam and then fold it over again to enclose the raw edges. I thought it would help keep down the unraveling from pulling credit cards in and out of the pocket. I planned my layout in terms of the finished product. I placed pattern pieces on the best spots in the fabric so that it would look the nicest when it was sewn up. For example, I placed the inside pieces on small flowers and i centered the outside piece on a large rose set. I also cut the striped pieces all in a line so the stripes would match up when completed. 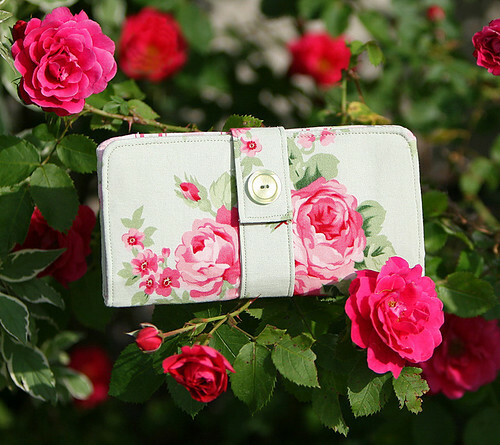 This wallet was made to match a bag previously blogged about. You're really--out of this world! Incredible!